The James Beard Foundation has nominated the Eat In My Kitchen book for the prestigious James Beard Award 2017 in the General Cooking category, alongside Ina Garten’s Cooking for Jeffrey and Cook’s Science’s How to Unlock Flavor in 50 of Our Favorite Ingredients! This is crazy, I thought I was going to faint! Thanks to my man I didn’t loose it completely. So what can you do, when life does these funny things that make you speechless? You just sit there, quietly, silently, wait until it sinks in – and you book a flight to New York where the award ceremony is going to take place in April. I’ll keep you posted. Once my adventurous trip was booked and I felt my stomach again, I made crêpes. You remember that, last week, I shared my new favourite pancake passion with you: crêpe au citron. When I went to Normandy and I found that wonderful Crêperie in the village of Le Touquet, I new there would be lots of thin crêpes on my own kitchen table in the near future. 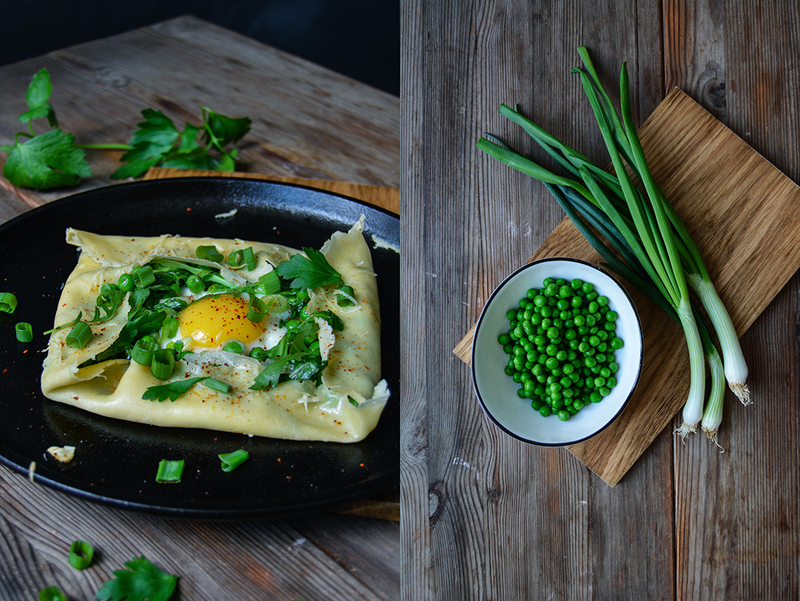 After the citrusy dessert, we can move on to the main course: green shakshuka crêpes. I didn’t find this particular recipe on the menu of my little French village restaurant, but another hearty treat that was also a pure pleasure. It was a galette (buckwheat crêpe) filled with ham, cheese, and a soft egg. It was the best comfort food you can think of, especially when you can smell a salty breeze in the air and you have an endless long beach right in front of you. 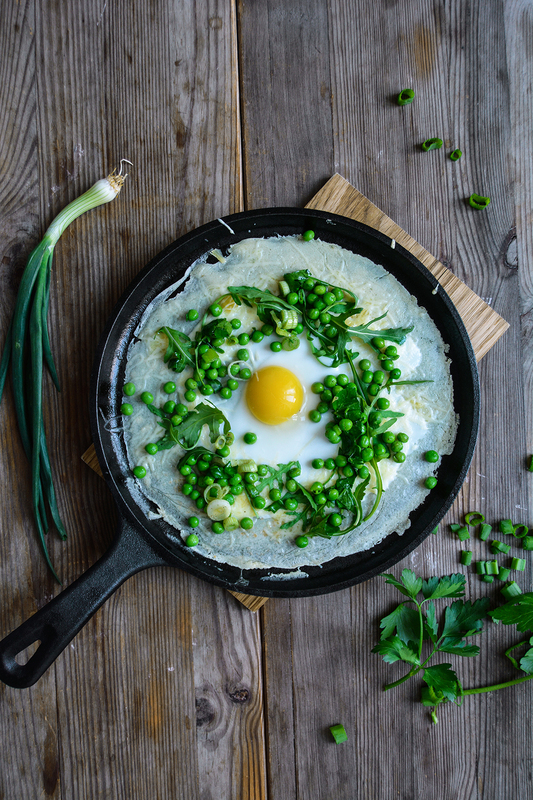 Personally, I prefer a normal crêpe over a galette, it works just as well in combination with a savoury filling (however, in my recipe below you find both options). 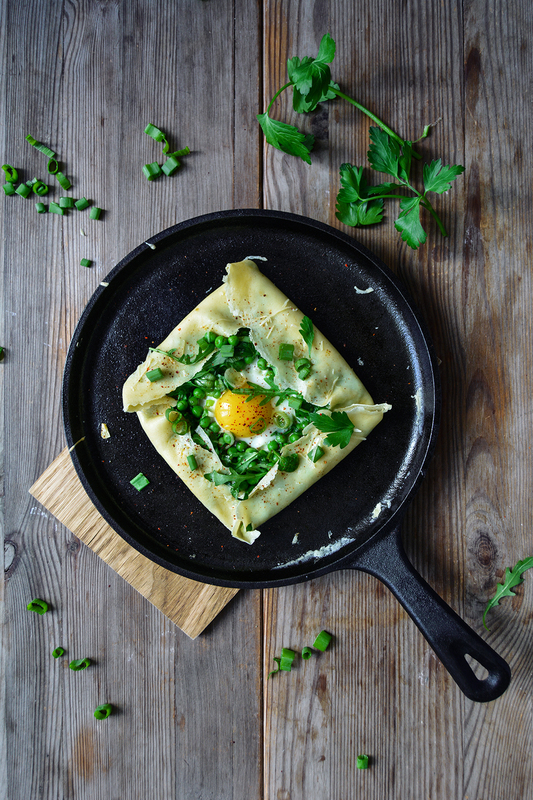 First I just wanted to share the classic with you – ham and cheese – but then I saw a green shakshuka somewhere and I could already see it in my mind, wrapped in a crêpe. As the pancake filling shouldn’t be too soggy, I only went for peas, spring onion, and parsley stirred in cumin-garlic oil. 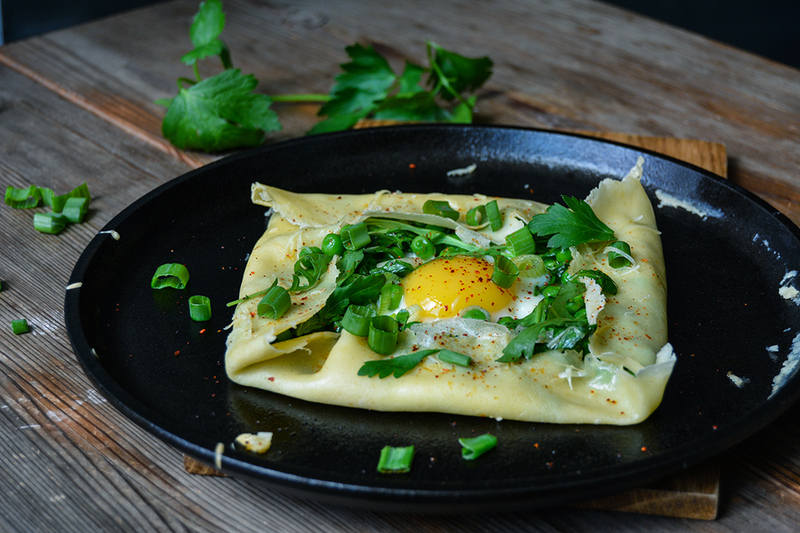 Arugula leaves and Gruyère cheese sprinkled over the cracked egg cooking slowly on top of the crêpe, and it was done. It’s aromatic and fresh, slightly eggy with a soft hint of cumin, and the greens taste like spring. I seasoned it with another souvenir that I brought home from France: peppery Piment d’Espelette (Gorria chilli pepper powder). We enjoyed this green beauty for lunch and dinner, but I can also see it on a Sunday breakfast table! 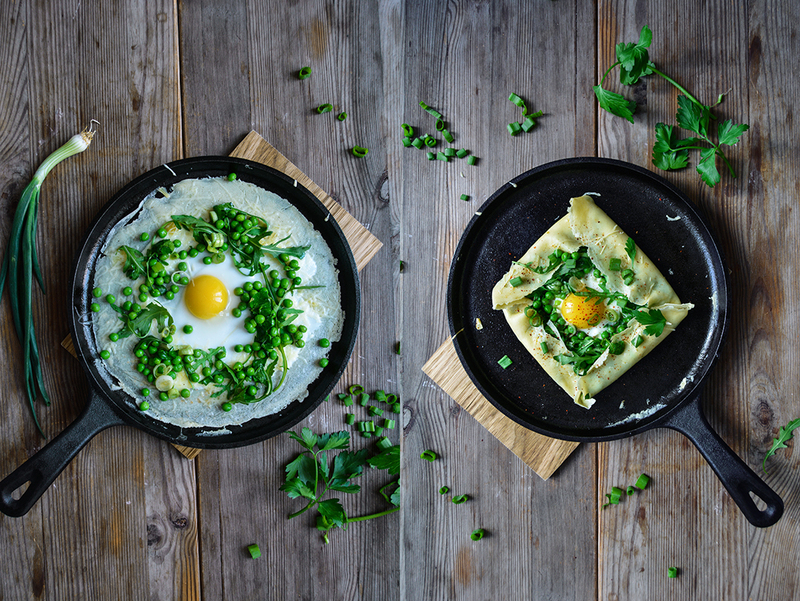 If you prefer to make galettes (buckwheat crêpes), replace half the plain flour with buckwheat flour. For the crêpes, in a large bowl of a stand mixer fitted with a whisk, mix the flour, sugar, salt, eggs, and milk until smooth; let the batter sit for about 10 minutes (at room temperature) to 1 hour (in the fridge). For the filling, in a medium saucepan, heat the olive oil, garlic, and cumin over high heat and cook until it starts sizzling. Take the pan off the heat immediately and stir in the peas, 3/4 of the spring onions, and the parsley. Season with salt, pepper, and additional cumin to taste and set aside. In a large, heavy or non-stick pan, melt half a teaspoon of butter on medium-high heat. Pour in a large ladle of the batter, holding the pan in your hand and turning it so that the batter spreads evenly and thinly. Cook the crêpe for 30-60 seconds or until golden, flip around, and take the pan off the heat. Turn the heat down to medium-low. 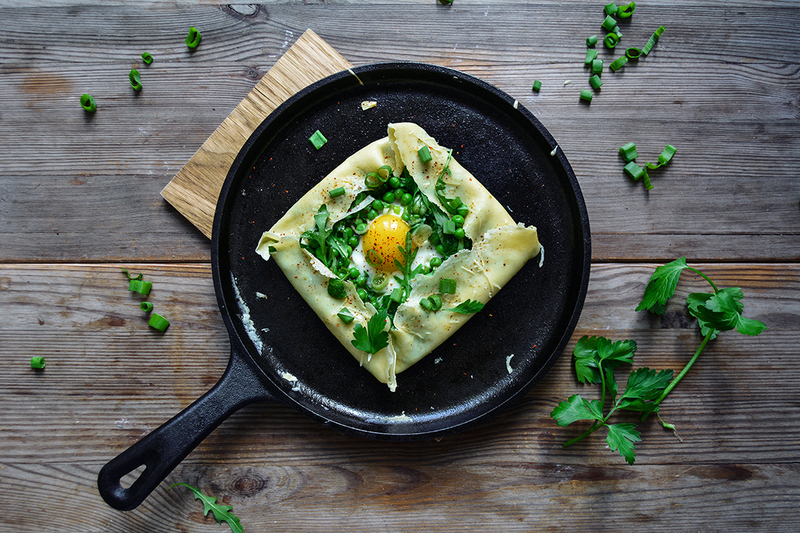 Carefully crack an egg in the middle of the crêpe, gently swirl the egg white a little so that it spreads a bit, don’t break the egg yolk. 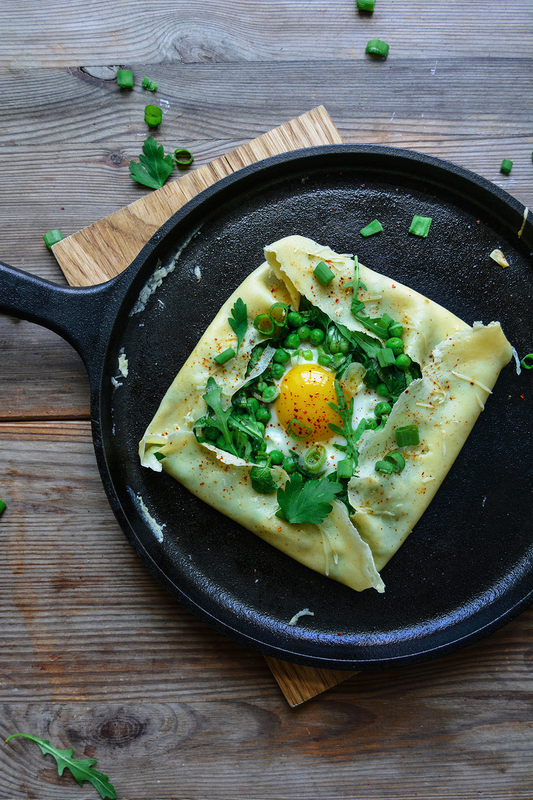 Spread 1/4 of the cheese and 1/4 of the shakshuka filling, and 1/4 of the arugula around the egg yolk (see 1st picture) and fold up 4 sides of the crêpe so that your end up with a square shape. 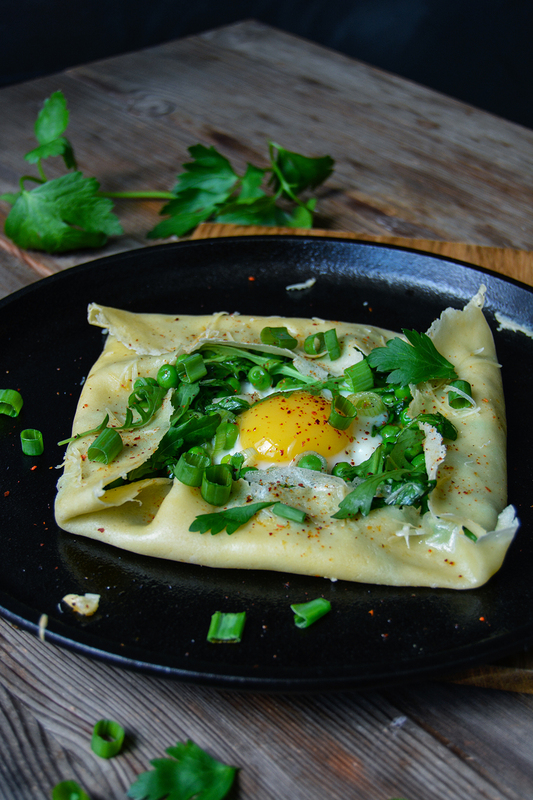 Leave the egg yolk uncovered. Put the pan back on the heat and let the egg white set, the yolk should stay runny. If the bottom of the crêpe gets too dark, turn down the heat. Sprinkle with 1/4 of the remaining spring onions and season with Piment d’Espelette or ground pepper to taste; serve immediately. Continue cooking and filling 3 more crêpes, you should always melt 1/2 -1 teaspoon of butter in the pan before you cook the next crêpe. You can use any remaining batter (made of plain flour) to make crêpe au citron. A) these look absolutely phenomenal and B) so many congrats! I can only imagine how over the moon you were upon hearing that news. It’s no wonder though with recipes like these. I appreciate this because it’s simple ingredients you likely have around but definitely something different. Will definitely give it a try. Cheers! Oh how exciting! Good luck! Congratulations Meike! So very much deserved! The book is beautiful, and so is this recipe-can’t wait to make it this afternoon!